■ JR Chuo Line. 10 minutes from Isawa-onsen （Nearest station） by bus. ・ Fuji kyuko bus For Oushuku. Get off at Yamanashi Prefectural Museum (Yamanashi Kenritsu Hakubutsukan). 3 minutes walk. ・ Taxi is also convinient (approx. 1,100 yen）. ■JR Chuo Line/Minobu Line. Approx. 30 minutes by bus from Kofu station. ・ Yamanashi kotsu bus for Yamanashi Prefectural Museum (Yamanashi Kenritsu Hakubutsukan- Station No.3 on North Exit) 510 yen. ・ Fuji kyuko bus for Fujiyoshida Station/Shimo-kurokoma (Station No.7 on South Exit) . Get off at Yamanashi Prefectural Museum. 510 yen. ※CAUTION: Each bus departs from different exits. ■JR Chuo Line. 35 minutes walk from Isawa-onsen station. Head south from Isawa-onsen station exit (south exit only). Turn left on the intersection with Route 411 and head east. Turn right on the Onmyoji Temple intersection. Cross over Fuefuki River on Ukai bridge. Walk past Fuefuki Fire Department on the left. Go under Route 20 at the Nagazuka intersection. Proceed about 200m and the first signal will be the entrance to the museum. 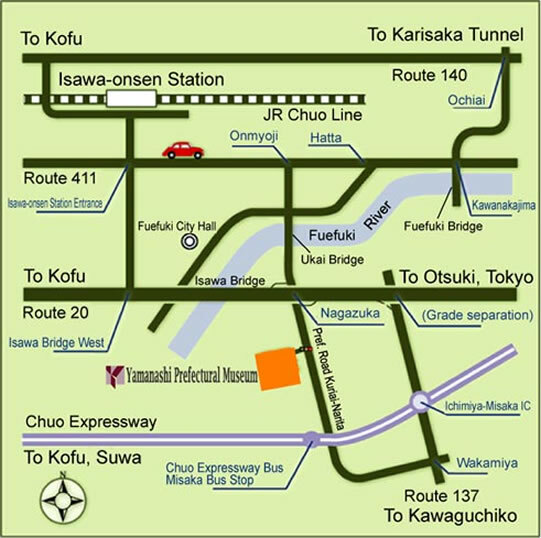 ■Highway Bus: Chuo Kosoku Bus （Southern Route） 15 minutes walk form Misaka bus stop on Chuo Expressway. （Head east. Turn left on Ninomiya intersection. Proceed Route 137 for Isawa）. 8 minutes from Ichinomiya-Misaka Interchange. Exit for Isawa. Proceed Route 137 (downhill). Turn left on the connecting channel to Route 20, just before the intersection with Route 20. Proceed Route 20 toward Kofu (West) . After Nakagawa intersection, there will be a grade separation. Go downhill on the grade separation. Turn left at the next iInterseciton (Nagazuka). To the right on the first signal is the museum entrance. Go turough Shin-misaka Tunnel on Route 137 for Kofu and Isawa. Turn left on Wakamiya intersection. Go further downhill. About 5km downhill on the left is the Musuem. Proceed Route 140 to Kofu. Turn left on Ochiai intersection in Yamanashi City. （Get off at Kami-Iwashita Exit when using West Kanto Driveway). When reaching Fuefuki River, turn right on Kawanakajima intersection. Head toward Kofu along Fuefuki River. At Hatta intersection (Y-intersection), you can take either road. Turn left on the next signal. Cross over Fuefuki River on Ukai Bridge, go under the garade separation of Route 20. Proceed about 200m and turn right on the first signal. Head Route 20 toward Tokyo/ Otsuki. Go through Fuefuki City Isawa-cho area. Cross over Fuefuki River on Isawa Bridge. After crossing over the bridge, the first signal is Narita. When you pass through Narita, there is a grade separation. Go downhill (left) on grade separation. The first signal is Nagazuka. Turn right and head for Kawaguchiko (south) . 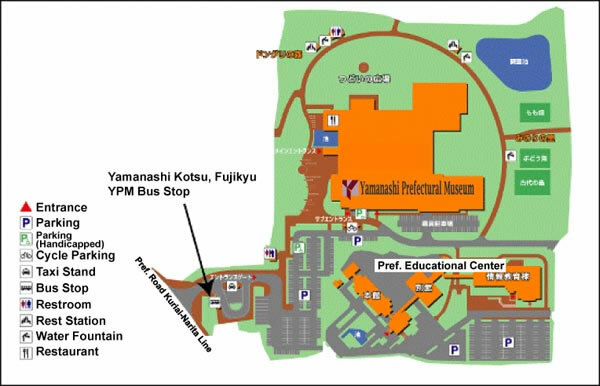 ※When using a car navigation system produced before 2005, set the destination to Yamanashi Prefectural Education Center.